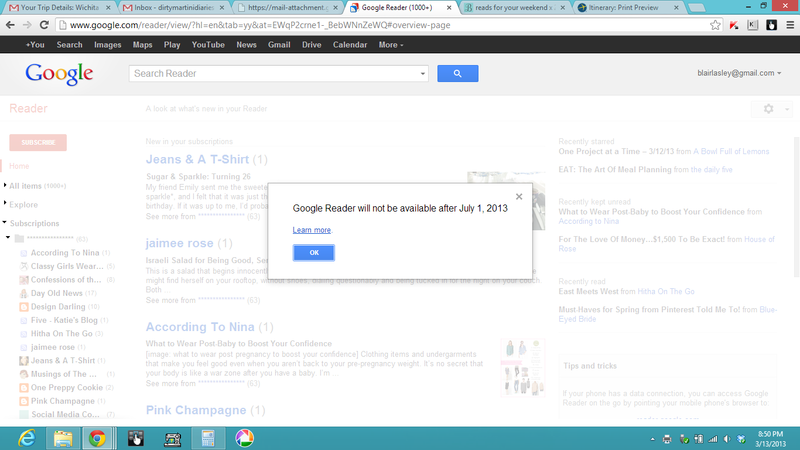 Turns out Google will be retiring Google Reader in July…. Does this make anyone else sad, or just me? Any suggestions regarding alternative options to aggregate the eleventy hundred blogs I’ve subscribed to over the past 5 years? I logged in tonight and was shocked too. I depend on Google Reader for all of my blog reading–on my laptop and iPhone. I read cnet's article on it a decided to try out Feedly. So far so good and I like it more than GR, much more. I saw this too! Def need to look into the alternatives! Okay, this may be a dumb question but why not just use your blogger dashboard? I tried Reader awhile back and got so overwhelmed because I don't read every.single.post. On the dashboard I just scroll through and click on the posts that are interesting to me.